The following content was originally created in this thread in /r/bloodborne. All credit for the content of this post goes to brvtus, with only minor changes being made to reflect the difference in format. This post explores who the Oprhan of Kos might be. There has been a lot of speculation about the Orphan of Kos and who exactly it is. A lot of people believe that the Orphan is the One Reborn, but that never really sat right with me, and I think that there's a lot more to it than that. Firstly, the One Reborn isn't listed as a Great One, and secondly the connection - that the Orphan and TOR have similar gaunt skeletal figures - is a little tenuous, since that's a descriptor that applies to a huge amount of enemies in the game. u/Aegon_of_Astora did a video proving that the sobbing sound in the Orphan of Kos cutscene is the same soundbite as Gehrman’s sobbing in his rare “dreaming” dialogue, where he calls out to Laurence and Willem and begs to be unshackled from dreaming. Given that they bothered to splice the new audio of a baby crying into it, this is probably not a recycled asset but a deliberate choice. Gehrman also has another “sleeping” dialogue where he’s addressing Laurence directly, who also happens to be in the Hunter’s Nightmare. After defeating the OoK, the Doll has an extra dialogue where she talks about how she can hear Gehrman sleeping soundly, and that on any other night he would be restless and suffering. This is less concrete, but IMO the OoK is visually and pacing-wise pretty similar to Gehrman. It’s placenta weapon (definitely a placenta btw, if you look closely it’s still connected by umbilical cord) kind of reminds me of the Burial Blade’s cleaving edge and the transformation into it’s second stage feels like Gehrman’s own power-up. Kos washed up dead in the Fishing Hamlet but it was pregnant with child, and this fetal Great One was still alive and gestating inside of Kos’ carcass, subsisting off it’s placenta. When the Byrgenwerth scholars came, they extracted the still-living Orphan from it’s womb, a forced traumatic birth, and performed live experiments on it. This is where they obtained the Third Umbilical Chord that Gehrman kept at his Workshop, the Umbilical Chord that precipitated (accelerated, caused) his encounter with the Moon Presence. Based on u/LeeJP's take on the DLC, I think that Kos's umbilical chord was split intothree and make up three of the four umbilical chords we find in the game. The one dropped by Fakesefka, that she pillaged from Byrgenwerth and was used to ascend Rom; the one used by the School of Mensis, successors of Byrgenwerth, to grant Mensis audience with Mergo; and lastly the one in Gehrman's workshop that was used to contact the Moon Presence. This is why the note in the Lecture Theatre reads "three one third chords" - it's actually been split. The one that drops from Arianna, I'm not sure about. I think it might be unrelated and belongs to her own body. Gehrman played a major role in the purging of the Fishing Hamlet and therefore holds an enormous amount of the guilt. The Great Ones are described as being “sympathetic” in spirit, and I think that’s saying that their minds basically work on a similar enough wavelength to our own that they psychically sense and respond to our emotions. Presumably this works both ways, and they are able to impart their own emotions psychically onto us. Revising my theory on the creation of the Hunter’s Nightmare, I now believe that the encounters that pulled the Fishing Hamlet and the original Grand Cathedral into Nightmare were separate. 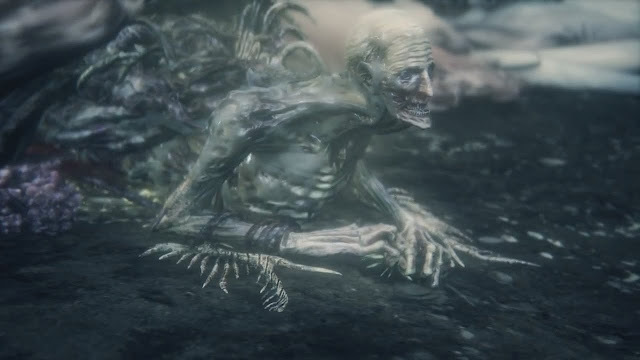 The nightmare Fishing Hamlet was created first, by the ghost of the Orphan of Kos, initially as a prison specifically to trap and torment Gehrman. This event might also have taken place at the Byrgenwerth Lecture Theatre, which is how it became adrift in Nightmare, although it’s more likely that this was a separate event as the Lecture Hall is more of a liminal space between nightmare realms rather than being part of the Hunter’s Nightmare. All of the characters in the Hunter’s Nightmare seem to be suffering an appropriate fate for the sins they’ve committed. Ludwig is a twisted amalgam of all the lives he’s responsible for taking; Laurence burns eternally for his part in the burning of Old Yharnam; Maria is tormented by her failure to protect the Hamlet. The Orphan basically “imprinted” upon Gehrman, and Gehrman’s punishment in the dream is that every time he falls asleep in the Hunter’s Dream he slips into Nightmare and experiences the unimaginable trauma that the Orphan felt, of being torn from the womb broken and incomplete. u/FLRSH pointed out that this potentially recontextualizes the game's endings, something I hadn't fully considered. "In the vanilla game ending where we kill Gehrman, we're setting him free to finally die as he should have long ago, except he's actually going straight to the Hunter's Nightmare to suffer, likely. By defeating the Orphan of Kos and stopping the curse of the Hunter's Nightmare, where all Hunter's go when they die to live out some kind of torturous hell, we're allowing Gehrman to actually rest in peace when we kill him." I think that Gehrman's soul and possibly his body as well is tethered to the Hunter's Dream - this is the plane in which he "awakens". When he sleeps in the dream, he slips into the Nightmare. Presumably, killing Gehrman frees him from the Hunter's Dream but without defeating the Orphan he would become trapped in the Nightmare forever. Perhaps this gives further context to why Gehrman sought ascension into the Dream and is so adamant about remaining there - perhaps his motives weren't so selfless after all, he could not stand anyone else usurping him as the Moon Presence's prisoner because it's the only thing keeping him from being trapped in a far worse fate. Additionally, I’ve been playing around with of the Eye of a Blood Drunk Hunter being an actual portal through which we travel to the Hunter’s Nightmare. The description of the Blacksky Eye describes it’s pupil as vast stretch of black sky, a portal in which a meteor storm rumbles endlessly. The pupil of the Blood Drunk Eye is crushed by the Beast plague but strongly resembles the crushed sun in the Nightmare. Additionally, pretty much all the items that the messengers gift us in the Hunter’s Dream belonged to Gehrman (all the Bells especially) which makes sense because the Dream belongs to him in many ways, so it’s not a leap to imagine that the Eye belonged to Gehrman as well. It might not be his eye, but I believe that it belongs to him, and is portal through which the Nightmare pulls in the souls of Hunters. This is why the Orphan gazes so longingly at the sun, hoping to be freed. After defeating Amelia, Gehrman senses both your curiosity and your potential, and gifts you the eye in hopes that you might free him and his compatriots. The apparition that hangs out around Kos’ corpse is the true ghost of the Orphan that sustains the Nightmare, with the Orphan that we fight being a constructed body based on Gehrman’s own wizened form. This doesn’t make him any less of a Great One; the Orphan we fight is still definitely the Orphan, only possessed in some part by Gehrman’s consciousness as well. When we destroy the Orphan’s ghost, we finally close off the link between the Hunter’s Nightmare and the rest of the dreamlands, which is why the crushed pupil in the sky disappears. This is why the Doll tells us that Gehrman is now sleeping soundly, having finally been freed from one of the dreams he’s shackled to. I’m still trying to figure out what to make of the final cutscene and the deeply poetic dialogue in it. “A bottomless curse” probably refers to the curse placed upon the Hunters that traps them and all future sinners in Nightmare (curse the fiends, their children too), while “a bottomless sea” is less obvious. I think there’s a lot of associations between the dreamlands and the ocean - apart from several runes referring to great bodies of water as bulwarks guarding sleep (aka dreaming, I think this is actually alluding to blood and water being a medium through which the dreamlands can be accessed, as with the Moonlit Lake and Rom’s boss room), the Lecture Theatre is described as being “adrift” in nightmare, there’s a lot of ship imagery, etc. I think that the greater dreamlands are the metaphorical ocean, the infinitely vast bottomless sea, and when we destroy the ghost of the Orphan, we also free it from it’s own Nightmare that it had trapped itself in. The Orphan, the sweet, innocent child of Kos, was so consumed by it’s grief and pain that it had isolated itself from the greater dreamlands where the rest of the Great Ones reside and didn’t know how to find it’s way back. In freeing it, we end the curse of the Nightmare and the Orphan is returned to the oceans of dreaming, the infinitely vast freedom where all things are true and possible and accepted. If anyone is interested in my thoughts on The Old Hunters' lore, check out my commentated playthrough of the DLC! The second part just went up, and it's a lot denser and better edited than the first one. Great write up. I would tend to agree with most of it. I like the idea that the broken sun in the Hunter's Nightmare is actual pupil of the Eye of the Blood-Drunk Hunter but I don't think the look is terribly similar. The biggest thing I would say is again, I like the idea that Gehrman obtained his third cord from the Orphan but that he split it in three parts is unlikely. In the English localisation the cord is called a "third cord" and not "one third cord". Equally the message in the lecture building says "three third cords" suggesting that each cord is a singular entity each belonging to an infant great one.